If you're planning a spring/summer dinner party or buffet and looking for a great main dish, this is it. 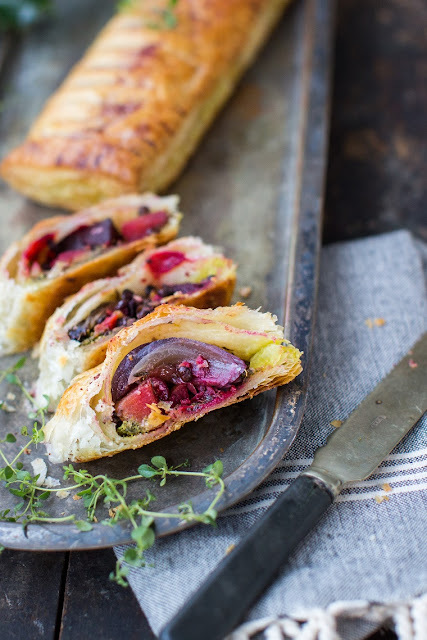 Suitable for all your guests, these vegan wellingtons are full of flavour, easy to make and delicious. Add a couple of salad or side dishes and you have a wonderful seasonal meal, or make it a centrepiece for your party or buffet. Wrapped in foil and then a tea cloth they will keep warm in your picnic basket too. 2. Put the beetroot, butternut squash, red onion and garlic into a roasting tin with 2 tbsp of olive oil. Season with salt and pepper, then scatter over the thyme and sumac. Toss the vegetables in the oil mix until well coated. 3. Roast the vegetables for 45 minutes, or until tender. 4. Remove the garlic cloves and squeeze out the pulp. Add half back to the tray, along with the lentils and chopped chestnuts. Mix thoroughly then leave to cool completely. 5. While the mixture is cooling, make the pesto. Place the rest of the cooked garlic, the watercress, pine nuts and lemon juice into a food processor and blend into a thick pesto. Taste and add seasoning as necessary. 6. Lightly flour a surface and lay out the sheets of puff pastry. 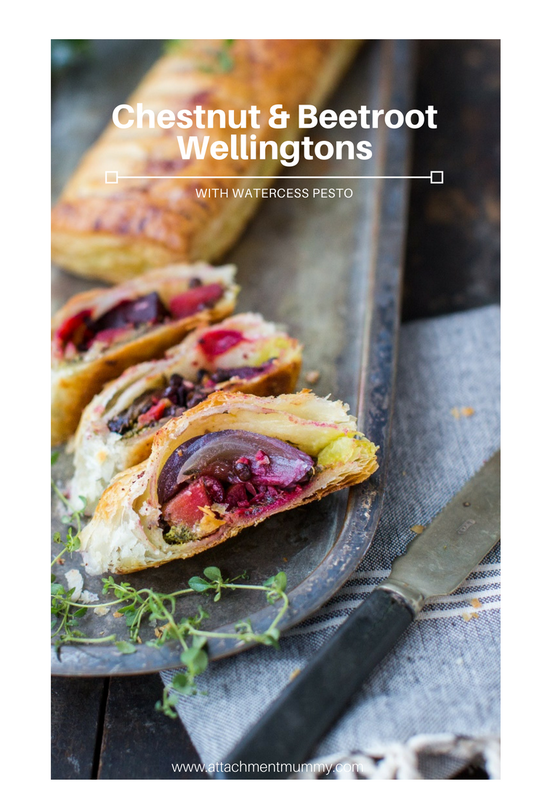 Cut each sheet into three to create six pieces of pastry for the six individual wellingtons. 7. Spread the pesto on one half of each piece of pastry, leaving the other half free of filling so that you can fold it over the top later. Leave a gap all around the edge of the pastry so that you can stick the edges together. 8. Divide the roasted vegetable mix between the six pieces, placing on top of the pesto. 9. Brush almond milk around the edges of each piece of pastry, then fold the plain half of the pastry over the filling. 10. Use a fork to crimp around the edges to seal in the filling, ensuring that no air is trapped inside. 11. Once the edges are crimped, use a sharp knife to trim them back into a neat rectangle shape. Cut a small hole in the top of each wellington to allow any steam to escape during cooking. 12. Line a baking tray with greaseproof paper. Place the wellingtons on the tray, cover with cling film and chill for at least an hour, preferably overnight. 13. Preheat the oven to 190°C. Brush the top of each wellington with a little more almond milk and sprinkle with sumac. Bake for 30 minutes or until piping hot and crisp and golden on the outside. 14. Scatter over some fresh thyme leaves and sea salt before serving. They are, and perfect for a summer picnic.